Next up on our weekend itinerary was the San Francisco Zoo. 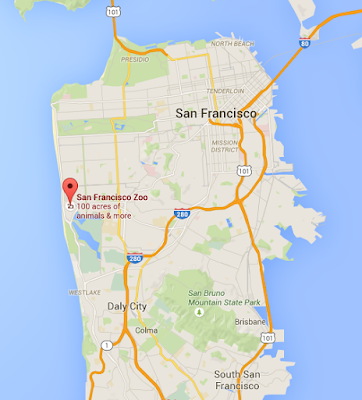 The San Francisco Zoo is located on the outskirts of San Francisco nestled against the Pacific Ocean on one side and Lake Merced on the other side along the Great Highway. The Great Highway runs along the city's western edge along the Pacific Coast and Ocean Beach. 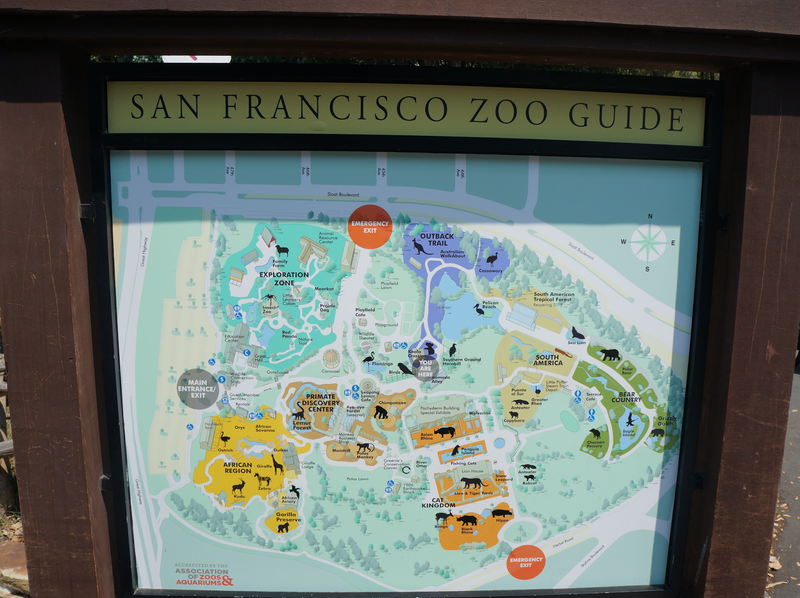 The SF Zoo is home to approximately 1,000 animals, 250 different species and gardens full of native and foreign plants. 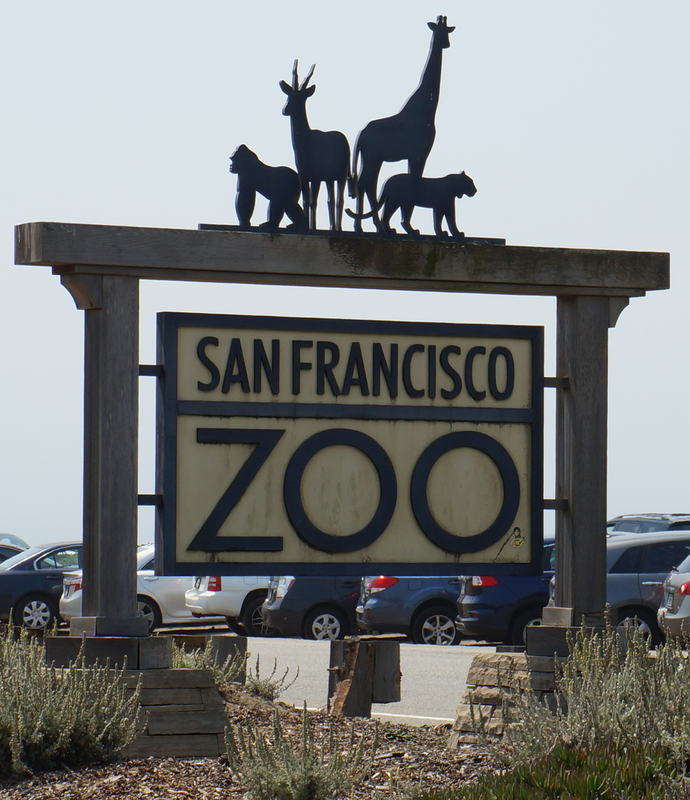 The SF Zoo is a fun trip for kids of all ages as there are lots of things to see and do at this zoo. The SF Zoo is still quite large (or bigger than a few zoos I've been to) and depending on what age kids your traveling with, you may want to try to plan your route through the zoo accordingly. The different areas of the zoo are shown in the picture below and the route we took is detailed in order below. Based on our experience, it worked well for us. We were able to visit all of the different areas of the zoo in a little over 2 hours and likely could have spent more time there if we'd chosen to do so. Our first stop was the African Savanna to see giraffes, zebras, ostriches, kudu and duikers. There is also an African Aviary and a Gorilla Preserve. River otter, asian rhino, penguins at Penguin Island, lion, tiger, bongo, black rhino, hippo, snow leopard, bobcat, anteater and a wolverine. There are spots in this area where kids may want to take a break and climb on various animal statues including a small elephant statue, where they can take a picture near the asian rhino, and near the hippo, where they can take a picture on a hippo statue. As you exit the Cat Kingdom you run straight into the 'Lion Fountain', which was empty and filled with plants likely due to the drought situation in California. Cross the train tracks for the Little Puffer Steam Train and you head into the South America and Bear Country exhibit area of the Zoo. 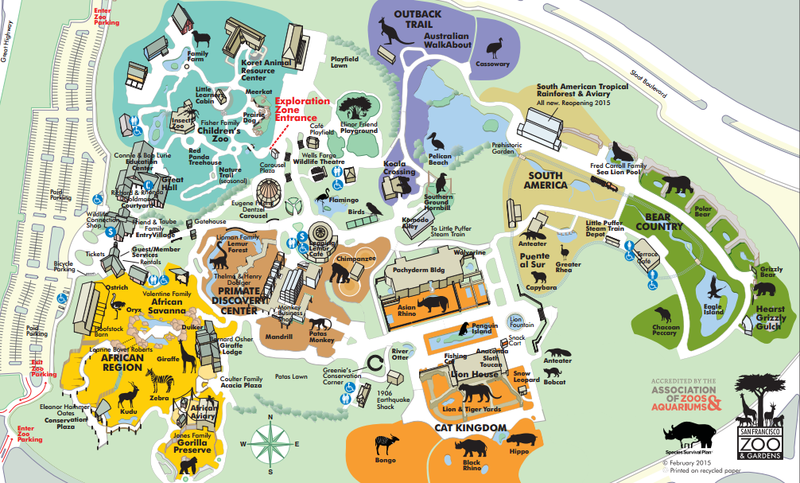 The animal exhibit in this area is fairly small and includes an anteater, capybara and rhea. As you make your way past this area, you will pass the boarding area for the Little Puffer Steam Train Depot. You could go for a train ride if you'd like. There is a small cafe and restrooms available between the two areas. As you make your way into Bear Country and pass the chacoan peccary, there are a few places to take pictures if you'd like with giraffe ears, a peacock tail or horns. In Bear Country you will find grizzly bears, a polar bear, eagle island and sea lions. Next go into the Rain Forest & Aviary Building where you will find birds, a sloth, an anaconda and other small critters. As you make your way out of the Aviary Building, you will come across a Prehistoric Garden featuring dinosaur statues. This area has a cassowary, kangaroos and koalas. As you leave the Outback you will come across birds to your right and primates to your left, with the 'Leaping Lemur Cafe' and flamingos directly in front of you. This is a good place to stop, take a break and grab some snacks before visiting the last two parts of the zoo left to see. The primate discovery center features chimpanzees, lemurs and the Lemur Forest, mandrills and patas monkeys. The Lemur Forest features an elevated walkabout and is a nice area, as you'll feel your in an actual lemur forest. Unfortunately on the day we visited the chimpanzees weren't out and since it was a hot day in SF the lemurs were lethargic and lounging around. We came to this part of the zoo last as we wanted to see the bigger animals first and try to beat the rush around those areas of the zoo. The Children's Zoo area is comprised of an insect zoo, carousel, playground for all ages, family farm petting zoo, meerkats and a prarie Dog. For the last part of our visit, we stopped by the Zoo shop to see what kind of souvenirs and trinkets they offered. 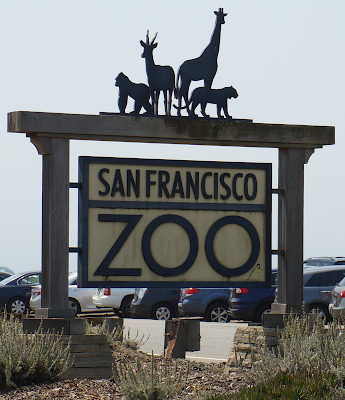 The SF Zoo is accredited by the Association of Zoos and Aquariums (AZA) and if you are a member of another reciprocal zoo, you can get a discount on tickets here. I was able to save 50% off admission prices with this benefit. Also, if you are a SF resident you can get a small discount with proof of residency. Parking is $10 on weekends/holidays or $8 on weekdays. You could park for free along Sloat blvd and around Lake Merced if you are willing to walk a few blocks to the zoo entrance. If visiting on a weekend, I would strongly suggest getting to the zoo early and right when they open. When we were leaving around 1:00 pm, the line to get tickets into the zoo was very long and waiting in long lines with kids can be difficult.